Introducing Master Luo De Xiu. I began my journey with Luo in 1999 and still train with him today, when I can find him that is. You'll most likely meet Luo Dexiu teaching a seminar somewhere in the world, you might also think that you know him after attending his lessons a few times on his world tour every summer... But let me be the first person to pop that bubble. The problem is Luo can be quite sociable and likes a drink or two, being very polite he will hang out after seminars, reeling off one story after another. This perhaps gives some people the impression that they are on much more personal terms with him than they really are. Over the years he may have become more relaxed and friendlier, but there was a time where you dared to ask a basic question, as he could destroy you with just a look. I remember one time in Taiwan years ago a couple showed up in Taiwan and strolled into the class all happy and all friendly with my teacher, I was really surprised... Here was my master, a kung fu genius, an old school Laoshi (teacher), being confronted by two seminar students from the US, "we only have very little time and so we would like to learn X.Y and Z" they said, Luo spent a few minutes with them and walked off to carry on with his lesson. I never saw them given any more attention and they didn't last more than a week, that were many of those situations over the years. 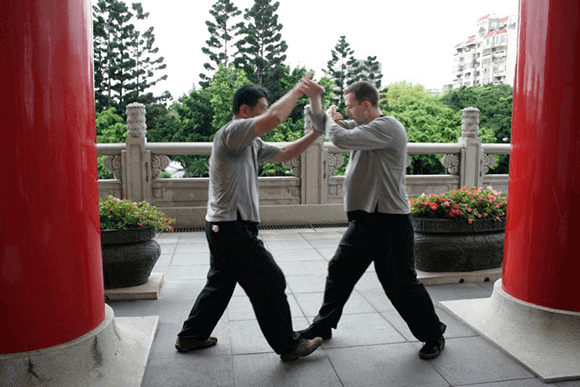 After 1974 Luo began focusing on Baguazhang exclusively and received informal teaching from master Hong's two brothers, Hong Yiwen and Hong Yimian, Luo also visited other teachers throughout Taiwan over many years slowly piecing together a more complete system of Gao style Bagua. Master Luo has studied and taught Internal Kung Fu for over 30 years, he truly carries on the strong fighting tradition of the Yizong lineage of Internal Kung Fu; there are many practical fighting principles and techniques taught by Luo Dexiu, he has always provided hands-on demonstration which helps make him one of the most open and generous Internal kung fu masters around. Today Luo divides his time up between Taiwan and the rest of the world... more and more often finding himself in Europe. In my opinion Luo Dexiu is an amazing kung fu master and even though he might have relaxed on certain things over the years, he'll always be a tough, no-nonsense, old school kung fu teacher to me.